History will be made on June the 8th at The Empire City Casino as The Salsa Warriors celebrate their 5th Anniversary and who better to celebrate with us, The legendary Ray De La Paz and His Orchestra performing his greatest hits. 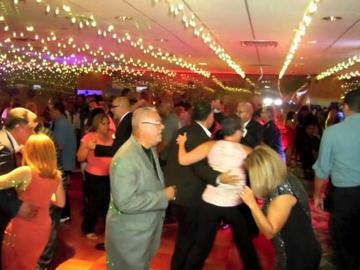 Ray De La Paz will be making his debut at The Empire City Casino to celebrate the milestone of Salsa Warriors playing The Best Salsa For 5 Years. Music will be provided by Dj Rey Boricua. Join us on June the 8th with Ray De La Paz with his orchestra at our home where it began 5 years ago, The Empire City Casino in The Good Time Ballroom. The Empire City Casino is located at 810 Yonkers Avenue, Yonkers, New York. Reserve your table and seat now. The celebration begins at 8pm June the 8th. I betcha by golly wow, this is the one you’ve been waiting forever. NO REFUNDS OR RAIN CHECK. PERFORMERS ARE SUBJECT TO CHANGE. Doors Open at 8:00pm, Birthday Celebrations Begins at 10:45pm Sharp, Free General Parking. Valet Parking Also Available (Fee applicable), Cash Bar Available, NO OUTSIDE FOOD OR BEVERAGES ALLOWED IN THE CASINO INCLUDING BIRTHDAY CAKES. Purchase Cake/cupcakes with The Empire City Casino. Dress in good taste. No T-Shirts, No Shorts, No Sneakers, Jeans may be worn fashionably, Coats are prohibited in the Party Room. Coats must be checked before entering the Party Room. Coat check is free. Coat check is located on the 1st level. All Bags are subject to security check. Bag check will be administered twice; when entering the Casino and The Party Room. For Birthday Celebration and to order cakes visit www.SalsaWarriors.com/tickets. Salsa Warriors, LLC. reserves the right to use any photograph/video taken at any event sponsored by Salsa Warriors, LLC., without the expressed written permission of those included within the photograph/video. Salsa Warriors, LLC. may use the photograph/video in publications or other media material produced, used or contracted by Salsa Warriors, LLC. including but not limited to: brochures, invitations, books, newspapers, magazines, television, websites and other promotional material.